Nazem Kadri's suspension yesterday caused some calamity among Leafs Nation. Some voiced disgust at the inconsistency of the NHL's Department of Player Safety. Those fans were often chastised by those who asserted that blown calls (such as Brian Gionta's and Milan Lucic's undisciplined hits on goaltenders) don't justify turning a blind eye to similar incidents. Kadri's hit merited discipline of some sort--perhaps three games was too severe, but some sort of punishment was justified. The justness of the sanction, however, does not mean that fans can't be frustrated with the NHL's inconsistency. Indeed, Leafs fans are probably particular aggravated because commentators have been reprehending the franchise quite a bit lately. As though these censures weren't bad enough on their own, some of them are coming from Mike Milbury and Kerry Fraser, commentators who have apparently lost all sense of irony. Mike Milbury claimed that Kadri's hit on Mikael Granlund was "even worse" than the collision with Niklas Backstrom. Milbury argued, "This is when someone has to take care of Nazem Kadri." By "take care" he meant fight: Milbury clarified that opponents should find a way to fight Kadri or another one of the Leafs' stars in order to police the game. The NHL exonerated Kadri for the hit and tacitly supported Randy Carlyle's suggestion that the refs overreacted by giving Kadri a match penalty for hitting Granlund, who had his head down and didn't properly prepare himself for taking a legal hit while in possession of the puck along the boards. My problem with Milbury isn't so much that he's calling on the league's enforcers to take runs at the Leafs' star players. No, I'm taking exception with the fact that he's making such a call shamelessly. To put things bluntly, no player in the league today has manhandled an opposing club as much as Milbury mangled the New York Islanders. The list of players that he traded away, opted not to draft, or couldn't draft due to inept trades is damning. Had it not been for Milbury, the Islanders could have had Zdeno Chara, Jason Spezza, and Roberto Luongo on their current roster. 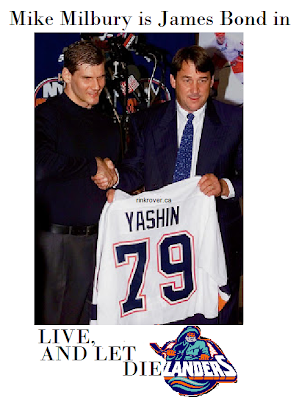 Milbury was either the most inept General Manager in NHL history or the most skilled saboteur, who conducted espionage for rival clubs while ostensibly managing the Isles. Is this giving Milbury too much credit? Either way, it seems fair (according to Milbury's sense of justice) to expect Matt Carkner or another Islander to give the former GM a dressing down for what he did to the club. I'm not arguing that NHL players should get into a physical altercation with a civilian, but that would be poetic justice in this case as Milbury once beat up a fan with his own shoe at a Rangers-Bruins game. The other commentator to harangue the Leafs lately is Kerry Fraser. Yes, that Kerry Fraser. The former referee, who achieved notoriety for blowing a crucial call on Wayne Gretzky during a playoff game between the Los Angeles Kings and Toronto Maple Leafs, called out a current ref for missing a call. On November 2nd, Henrik Sedin dodged Lupul's errant elbow during a game. Lupul's aimless appendage ultimately struck Kadri's head, which possibly skewed #43's judgment of when it is appropriate to pull a Lucic or a Gionta on an opposing goaltender. Here's a video of the incident. I'm not going to weigh in on whether the move was or wasn't intentional, or whether or not Lupul should have been given a match penalty for attempting to injure another player. I'm not even going to take issue with what Kerry Fraser said about the incident as his comments were well-reasoned and thoughtful. That said, come on! Does Kerry Fraser really need to bring up this issue? Couldn't he let someone else point out the supposedly blown call? Has he not been receiving enough hate mail from Leafs Nation lately? Was this commentary staged for an episode of Curb Your Enthusiasm as a sequel to the Bill Buckner episode? Seriously, even if Lupul had gotten away with climbing on top of Roberto Luongo's net and delivering a WWE-style elbow drop to Sedin's head, Fraser shouldn't be the one to call anyone out for the blown call. If there are any universal truths in life, they are that Sean Avery should never be upset when anyone refuses to shake his hand, Claude Julien should not accuse other teams of embellishment, and Kerry Fraser shouldn't rebuke anyone for a blown call.